Kookaburra Distributors gets the job done right! KOOKABURRA DISTRIBUTORS PTY LTD is the largest supplier of Polystyrene foam in the Illawarra, South Coast and Highland area. We are also the largest supplier of Polystyrene moulds to the Refractory Industry in Australia. 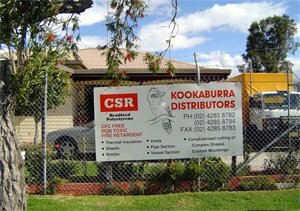 KOOKABURRA DISTRIBUTORS supplies and distributes a wide range of products and services on behalf of several large Australian manufacturers. We also specialise in Polystyrene Pattern and Mould making, as well as, manufacturing building profiles. Our service territory encompasses the Illawarra region down to the Victoria border. We have also supplied stage props for local dance schools and advertising agencies. We also supply Polystyrene Insulation Foam to meet Building Code item 37.